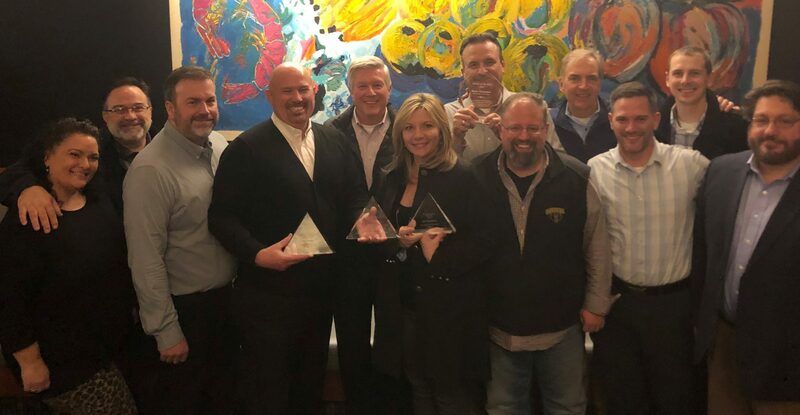 Lakeville, Minnesota: Adams Radio celebrated 2018 successes this with several awards at its annual managers conference. Photo attached. From Left to right: Shannon and Tom Pinkus (Vipology), Jason Lamp (GM Tallahassee), Mike Jenson (GM Las Cruces), Ron Stone (CEO Adams Radio Group), Jen Figg (GM Northern Indiana), Kevin Musselman (GM Fort Wayne), Trey Morris (Center for Sales Strategy), Jim Richards (Valley Richards), Mike Orth (VP Digital Adams Radio), and Tyler Plahanski (Neilsen). Winning the award for Best Start in 2019: Kevin Musselman, Fort Wayne. Ron Stone, CEO of Adams Radio Group commented “We are so appreciative of all our managers and staff for continuing to fight a good fight in the most challenging environment we have faced in radio. Our entire staff, from GMs to Part Timers are the most dedicated people I know. Their tireless efforts to keep Adams on a growth protectory speaks volumes about their professionalism and dedication. I thank all of them, and I am extremely proud of the award winners for 2018”. About Adams Radio Group: Adams Radio Group is a medium to small market radio group focused on local radio operations and creating great marketing opportunities in the local communities. We are heavily involved in the communities we serve and are dedicated to the growth and success of the communities and clients we serve. Our employees are well seasoned radio professionals that know how to work with local communities and businesses. The ownership group of ARG is comprised of individual investors led by Stephen Adams, who is Chairman and majority owner of The Adams Companies, a diversified group of companies encompassing wineries, outdoor advertising, recreational vehicles and related services.